A sustainability plan is under way to continue the Healthy Neighborhoods efforts to transform the way Delawareans approach their health. On Wednesday, October 3, 2018, a Healthy Communities Delaware (HCD) progress update and partner dialogue took place in a Town Hall setting at Delaware Technical and Community College in Dover. This was the first public meeting since the Healthy Neighborhoods Sustainability Development Workshop on June 12, 2018. The Town Hall was a continuation of the discussions and feedback that occurred at the workshop. Healthy Communities Delaware ambassadors, Dr. Steven Peuquet from the University of Delaware’s Center for Community Research and Service and Dr. Karyl Rattay, Director of the Delaware Division of Public Health, kicked off the meeting by reviewing the Healthy Communities Delaware model. 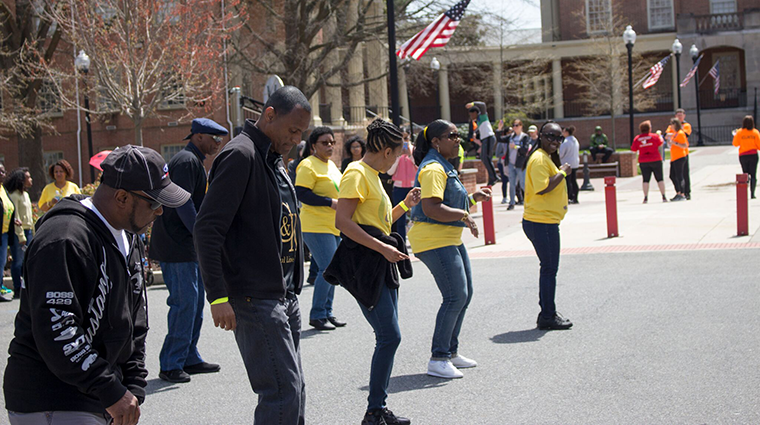 The State Infrastructure model was renamed to the Healthy Communities Delaware Infrastructure model to be inclusive of both the state and private entities that have and still work to move the Healthy Neighborhoods initiative forward. The HCD sustainability model will: 1) engage potential funders via a proposed community investment council; 2) transition backbone organization responsibilities from a consultant to local entity or entities in order to provide communities with technical support to implement population-health multi-pronged interventions, and 3) launch a multi-sector guidance committee to oversee HCD. The Town Hall included a panel discussion. Panelists included: Liddy Garcia-Bunuel (Health Management Associates), Jane Vincent (University of Delaware), Brian Rahmer, Ph.D. (Enterprise Community Partners) and Susan Frank (Cinnaire). The panelists discussed the key components of the HCD sustainability model. A question and answer session followed. The first meeting of the guidance committee, recently renamed the “Leadership Council,” will be held on November 8, and in early December the inaugural meeting of the Community Investment Council will be convened. 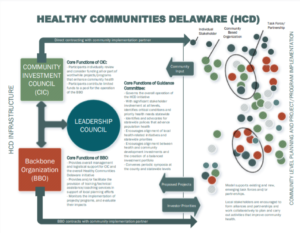 Since the State Innovation Model (SIM) grant was awarded by the Centers for Medicare and Medicaid Innovation (CMMI) in late 2014, the Healthy Neighborhoods initiative has generated strong stakeholder engagement, with three active local councils, each with neighborhood task forces representing approximately 40 percent of residents in Delaware. Last December, a disbursement model was created that allowed local councils to begin to draw down SIM funds from CMMI in support of local, community-driven initiatives designed to address one or more of four priority areas (behavioral health, healthy lifestyles, chronic disease, and maternal and child health). To date, CMMI has funded eight healthy neighborhood initiatives totaling $517,074, seven of which relate to behavioral health and one of which relates to healthy lifestyles/reducing chronic disease (see chart below for further detail).